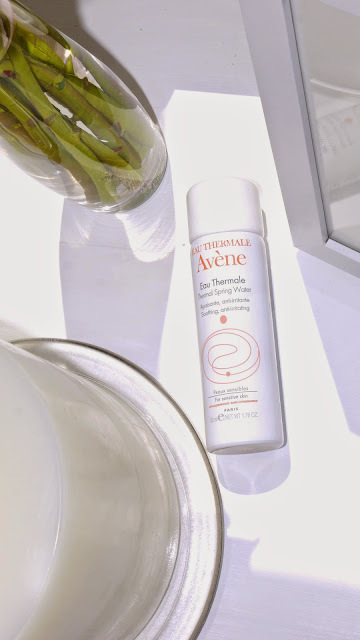 So in the few years I have been blogging, I never thought I would writing posts about 'water' but I am, strangely I have developed a little obsessing with the Avene - Eau Thermale Spring Water! This product had been collecting dust on the top of my makeup stash for ages when I decided to chuck it in my handbag so that I actually got some use out of it, and considering the only reason I purchased it was because id seen a few bloggers with it in there bags also I thought there must be a reason for it. 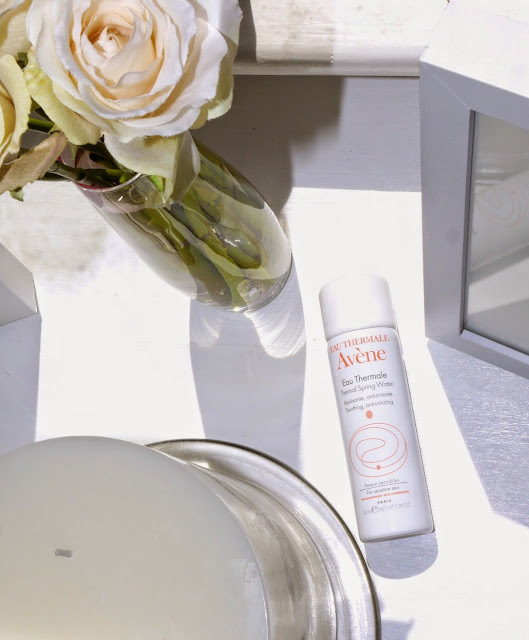 I had been using this product as a makeup setting spray, which personally I don't think it does much for your face other than make powders look less cakey and considering I don't wear powder it pretty much was a dud for me, until the ever careful Samuel came back home with delightful sunburn all over his face back and shoulders that I whipped it out of the handbag and sprayed it all over him before bed, I have no idea what possessed me to think this would work, I just assumed it would cool him down but no, he awoke the next morning near enough pain free and a whole lot less sunburnt, couldn't be down to the Avene could it? Well yes it indeed was as he continued to use it over the next day or so and it literally transformed his sunburn into a lovely golden tan, no peeling in sight! 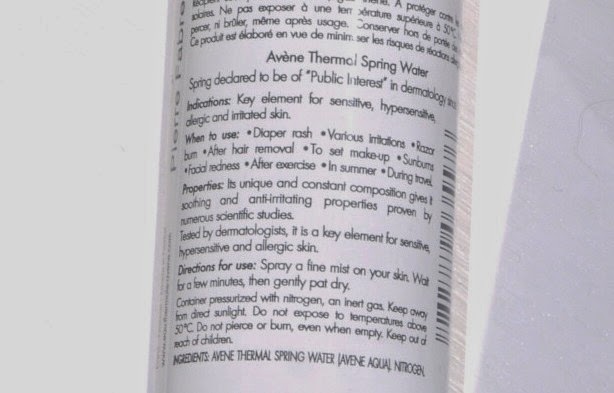 I hadn't ever read the back of the bottle before but on doing so I was surprised to see what exactly the product is aimed at, as you can see from the photo below it has a whole host of things it works on and I couldn't believe a 'water' product could work wonders on everything from nappy rash to facial redness, luckily I do not suffer from nappy rash but facial redness I do and have used on makeup free days to calm down the clown cheeks just a tad! Another little thing I have used this for is a little TMI but im afraid there's no boundaries where im concerned on this blog, I actually sprayed it 'down there' yes you can guess where I mean, I had a little sore shaving rash and it was seriously irritating me and I was finding it rather uncomfortable to wear underwear so I pulled out the trusty little can and sprayed away, left it overnight and woke to feeling literally no pain whatsoever, I know for many of us out there the bikini line pain can be abit of a problem and nothing has ever solved the problem like this before! Im so impressed by this wonder water in a can that im 100% heading straight out the door to buy the larger bottle (or 2) if theres one product you invest your money into this year this must be one of them, I cant stress enough how much this has saved my life for some of those really inconvenient problems we all suffer from time to time! Have any of you tried this and if you have let me know your thoughts! I've not tried this one but I love my La Roche-Posay one which is also thermal water and it's so soothing.